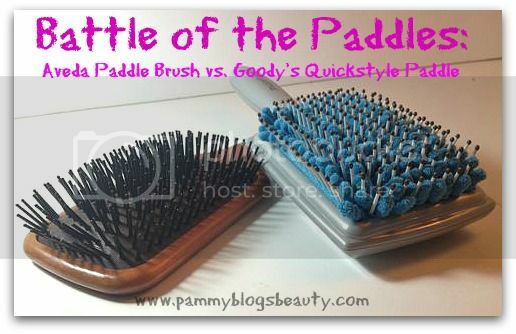 Pammy Blogs Beauty: Battle of the Paddles: Will the Goody Quickstyle replace my Beloved Aveda Paddle Brush? Battle of the Paddles: Will the Goody Quickstyle replace my Beloved Aveda Paddle Brush? It is the Battle of the Paddles! Will the new Goody Quickstyle Paddle brush with Absorbent Microfiber Bristles replace my long-time HG hair brush the Aveda Paddle? Hmm? An interesting debate! The Goody Quickstyle Brush's claims of reducing dry time really has me interested! A few weeks ago my very old and well-loved Aveda paddle brush broke. In the middle of my hair drying routine, I noticed that bristles started coming out. It looked like the rubbery base that holds the bristles cracked and the bristles were starting to release. While I was totally bummed, I literally had that brush for like 10 years. Considering that I used it practically every single day is a pretty darn good life span for a brush. I can't even tell ya'll how much I LOVE this Aveda paddle brush. I seriously don't know how to do my hair without it! Not only did my current one just "die", but this one replaced my previous Aveda Paddle brush that I had for almost the same amount of time. Yes, that is almost 20 years with the same favorite hair brush. My hair is super duper thick and very long. In addition, it is highlighted and a bit on the dry/damaged side. To make matters worse, my hair is extremely prone to tangles! Many brushes just get stuck in the tangles and make matters worse. I need a brush that can glide through my tangled mass of long hair without causing any damage. 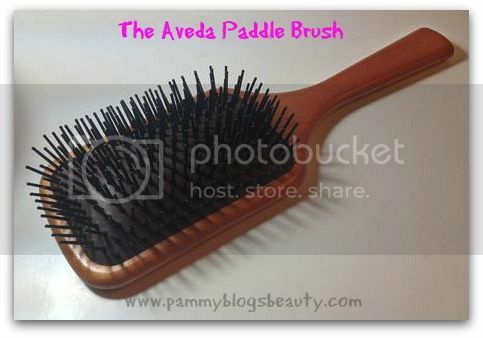 What is so great about the Aveda Paddle brush? It is just so easy to style my hair with this brush! It de-tangles and glides through my damp hair easily while not tugging at my hair. I am able to blow dry my hair pretty quickly using this brush. Since I already have straight hair, using this brush with heat is all I need for perfectly straight and smooth hair: no need for a flat iron! Plus, this brush is so gentle on my damaged hair. The paddle brush provides just a slight tension while brushing through (just enough to eliminate frizz in my straight hair). Also, this brush is huge! A large brush really works well for me and my super thick hair. It just provides more surface area to de-tangle and straighten my hair quickly. Last, but not least, this brush just "feels good" to use. The bristles and cushion of the brush give your head a nice "massage" when you use it. Needless to say, I pretty much immediately went out and bought a replacement for my broken Aveda brush. Sure, $20.00 is a little bit on the pricey side for a hair brush...but, it was money that was easy to spend knowing that I will give my new brush years of love and use. However, interestingly enough, the breaking of my old brush coincidenced with the arrival of my Influenster Cosmo Vox box which contained a very curious looking Goody Quickstyle Microfiber Bristle brush. I thought, hmm...could I love this new Goody Paddle Brush as much as the Aveda? It is exactly the same size and it promises to reduce water (to reduce dry time). Plus, it is a less expensive alternative to the Aveda! I am so intrigued!!! So, I am excited to try out the Goody Quickstyle Brush! I am so busy in the mornings with my 1-year old. I am always trying to get ready quickly while she takes her short morning nap. So, I appreciate any minutes that I can shave off my routine by reducing my hair dry time! All of a sudden my daughter seems to have gone from baby to toddler! Baby-hood goes by so quickly, doesn't it? To find out how I like the Goody Quickstyle Brush, please keep reading! The Goody Quickstyle Paddle Brush: It's like a towel and a brush in one. This brush was designed to de-tangle hair while reducing dry time (by effectively removing excess water). *In laboratory testing, the Goody QuikStyle brush removed an average 30% of water from hair across a variety of hair types. Results vary upon usage. What a unique-looking brush! Embedded within the regular ball-tipped plastic bristles are blue microfibers. These microfibers are like little absorbent "towels" interspersed amongst the bristles. These microfibers work to get the water out of your hair. Also, the brush is huge! Side-by-side, it is the exact same size as my Aveda Paddle brush. As I mentioned previously, a large brush works extremely well with my super thick and long hair. While the brush is quite large, it is still incredibly lightweight. Wow! Go ahead and call me impressed! This brush does seem to reduce my dry-time!!! Yay!!! I use this brush as I would any other brush to style my hair. I always air dry my hair as long as possible. When my hair is about 75% dry, I finish it off with the blow dryer. The combination of the heat and the microfibers does seem to get my hair dry a bit faster. What gets me even more excited? This brush seems to get my hair super-straight and smooth! The microfibers create more tension than my usual Aveda paddle brush. This extra tension plus the heat of the dryer results in super straight and smooth hair! Love!!! Combine the use of the Goody Quickstyle brush with fast-dry products like the ones I love from it Factor (It Factor Quick Blow Dry Shampoo and Conditioner and It Factor Simply It Quick Blowdry Smoothing Lotion). So, who wins this "Battle of the Paddles"? Honestly, it is a bit of a tie! No, my Aveda Paddle brush does not dry my hair faster than usual. However, I love how it glides effortlessly through my hair. It just "feels good" to brush my hair with the Aveda brush (almost like a "comb" for the hair). The Goody Quickstyle does not glide through my hair quite as smoothly. However, the Goody brush provides more tension which results in a smoother (and quicker) blow dry. 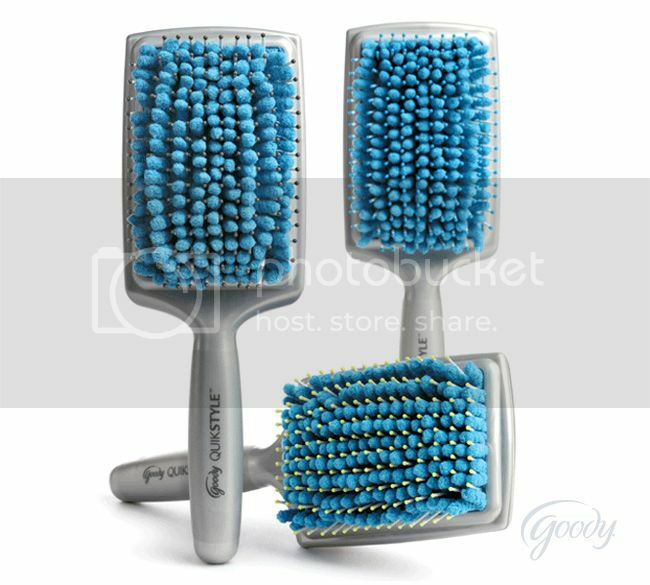 If you are looking for super smooth results and less blow-dry time, then for sure scope out the Goody Quickstyle Brush! Plus, the Quickstyle is only going to cost you about $12.00 at Target! The Aveda Paddle brush retails for $20.00 at salons and Aveda concept stores. What is your favorite hair brush? Does this new Goody Quickstyle brush intrigue you, too; or, does the Aveda Paddle sound like something that you would like? I'm SO trying the goody paddle brush now that I read your review!!! Thanks!!!! @MelissaMCadle-Thank you for reading! I hope you like the brush too! :) Have a great weekend! I actually just picked the Goody brush up last weekend while burning off a gift card, I've been eyeing it since I first saw it on their site. It's been sitting on my dresser and I forgot I had it!! After reading this it reminded me to move it to the bathroom! I really cant wait to try it out. I have really long and thick hair that seems to hold water like crazy!